Sundays at 9PM, after your folks have gone to bed. On CNN, in case you forget. At first glance, if it weren't for the CNN in the lower corner, one might think that Zero Point Zero produced "Parts Unknown" was simply a new episode of "No Reservations", Anthony Bourdain's previous ouvre on Scripps Network's The Travel Channel. That series' seven season run ended last year in a flame-out with a kerfuffle between the network and it's now estranged star over a car endorsement the star insists he never made. Suffice it to say, chef Tony will be ordering the Rolls Royce of margaritas from now on. I flipped over to CNN (perhaps for the first time in the history of my cable receiver) to watch an episode, but was instead greeted by the yearly high fives and glad-handing White House Press Correspondent's Dinner: an anual parading of news "celebrities" and "journalists" (a term that can only be applied to the uncool PBS, NPR and Al Jazeera tables these days, echoing host Conan O'Brien's "high school cafeteria" metaphor). A tony affair to be sure, featuring catered banquet food, booze and winking, clannish guffaws like this knee-slapper: "...if the president laughs, everyone laughs. If the Fox News table laughs, a little girl just fell off her bike...". The "doctors" mingle with the "patients" and everyone has a good laugh. Of all the gaffes in recent presidential history, failing to properly vett the host of the dinner will not be one repeated any time soon. Following the Correspondent's Dinner coverage, CNN reran the episode where Bourdain visits Colombia. I took notice when Bourdain, engaging his Colombian counterpart on the subject of the cocaine trade, summarizes several keys points the mainstream media (which, I suppose, Bourdain now is a member of in good standing) are too spineless to discuss: the war on drugs is a failure and a waste of money, and causes irreparable damage to the Colombian countryside and people. The idea is entertained that many of Colombia's problems would clear up if the war on drugs were to be called off, something Bourdain dutifully parrots "will never ever happen." Sadly, Bourdain may be right, and Bourdain is no tea-totaler nor moral hand wringer on the subject, himself a former crack-cocaine addict. "I'm with you, but it will never happen. The US will never allow it." Commercial break, and we're back: eating street food in one of Bogata's mercados. "Hang over food," repeated for emphasis, "I know hangover food." We know you know, Tony. Bourdain meets up with acclaimed author Hector Abad whose recent memoir, "Oblivion," is about the author's murdered activist father. They sit down for tamales stuffed in banana leaves. The subject of the drug war comes up again. Regional and local politics are discussed, along with past wars and the future of Colombia. Abad, whose father was killed asking "for clean water, a glass of milk, an arepa for every child," has only questions, but no answers. 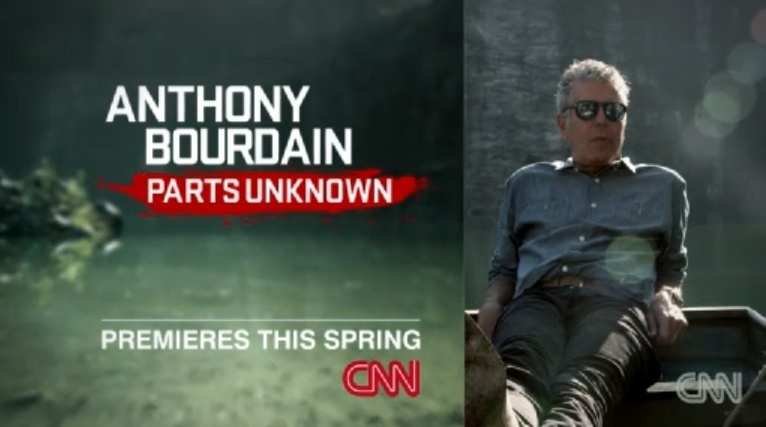 Still, the questions are being asked, and I'd rather it be by Tony Bourdain than dreamy airhead Anderson Cooper. Compare Colbert's performance at the Correspondent's Dinner to Bourdain's introduction to the world-at-large in his 1999 essay published in the New Yorker, "Don't Eat Before Reading This." A few years ago, I wasn’t surprised to hear rumors of a study of the nation’s prison population which reportedly found that the leading civilian occupation among inmates before they were put behind bars was “cook.” As most of us in the restaurant business know, there is a powerful strain of criminality in the industry, ranging from the dope-dealing busboy with beeper and cell phone to the restaurant owner who has two sets of accounting books. In fact, it was the unsavory side of professional cooking that attracted me to it in the first place. Let's just hope that Bourdain has the good sense to beg off any invites to next year's Correspondent's Dinner; on the same hand, let's hope he can control his rage (which is mighty and oft justified) better than cast-aside former opinion-maker Keith Olbermann who like Bourdain was unafraid to shed light on the unseemly underbelly of their respective professions (restaurants and cable news, both replete with scum, critters and varmin). Bourdain has signed on for another season of The Taste, thank the TV gods. Olbermann writes an excellent blog about baseball.